Quite simply, Mischief Theatre set out to create a masterpiece and made a spectacular mess - which is exactly what they were trying to do. The set is a superb interior of an English country house, lavishly decorated and furnished on two levels, giving every impression of a big-budget, serious play. The aura of sophistication and opulence is of course a perfect back-drop to comedy and since the audience has already been told things will go wrong, the expectation is for something like an Ernie Wise play or a Two Ronnies sketch. There are nods to the classic 60â€™s and 70â€™s comedy from the likes of Peter Sellers, Norman Wisdom and even Benny Hill but this a truly original show. With The Play That Goes Wrong, expect genuine, big surprises throughout as slapstick and parody are taken to heights possibly never before been seen on stage; the Everest of catastrophe has been conquered. 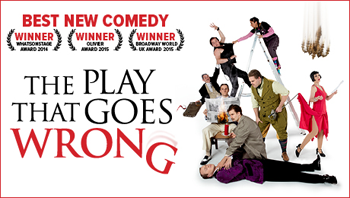 A parody on a murder mystery tale, The Play That Goes Wrong is a brilliant, relentless, immensely funny production that could not possibly work - which, of course, is just how it succeeds - with a superb script, gloriously comedic actors, deliberate incompetence and the most superb stage. The latter, laced with an array of self-destructive props with infinite potential for calamity, was a true highlight. So too was the performance of the cast, both collectively and individually, each of them playing their roles to perfection by being perfectly terrible, demonstrating the acting skills of a footballer feigning injury in the World Cup. A particularly crafty move was for the trouble to start before the show, beginning with the missing dog and continuing with the stagehands desperately trying - and, of course failing - to fix a myriad of shortcomings in the set. It set a tone from which the performance never wavered. With every imaginable catastrophe hitting the production - and a few unimaginable ones too - the play that went wrong went wonderfully right. If schadenfreude is your thing, then this will have you rolling in the aisles. And even if it isn't there will be something else to laugh at. In addition to laughs a plenty, there were incredulous gasps from the audience and some of the stunts are in the realms of both circus and stage magic. Particularly satisfying is that you come to the interval thinking youâ€™ve got the measure of things, expecting simply more of the same but the second half goes up several notches, not just with stunts but the whole fabric of relationships amongst the cast. There is not a point where the ongoing comedy becomes staid or predictable; the laughs and surprises keep on coming right to the end. On a night when bad was good, worse was superb and the ridiculous was standard, the audience was left in constant hysterics. The same will be true of every performance. Quite simply, the play was everything that a proper night at the theatre should not be, which is exactly what made it so good. This a play for everyone and a perfect place to take a non-theatre going friend to as an abject example of just how funny and engaging a big stage production can be; a marvellous night out.